Great cards! Love the images you used… wow! great job on the masking! TFS! 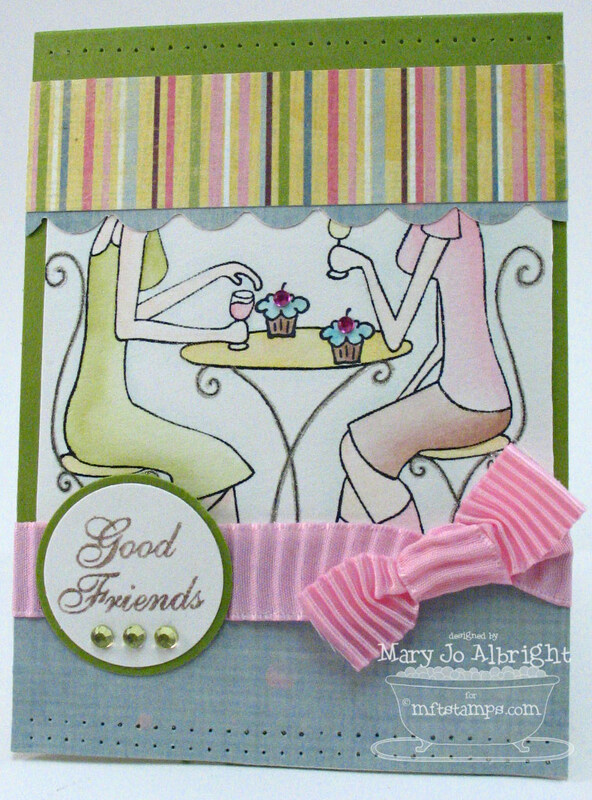 Wow, what fabulous cards, Mary Jo! Fabulous coloring and OMGoodness, all the masking on the 2nd one — phenomenal!! Thanks so much for the mention, sweetie! You and I had similar ideas with the cupcakes! 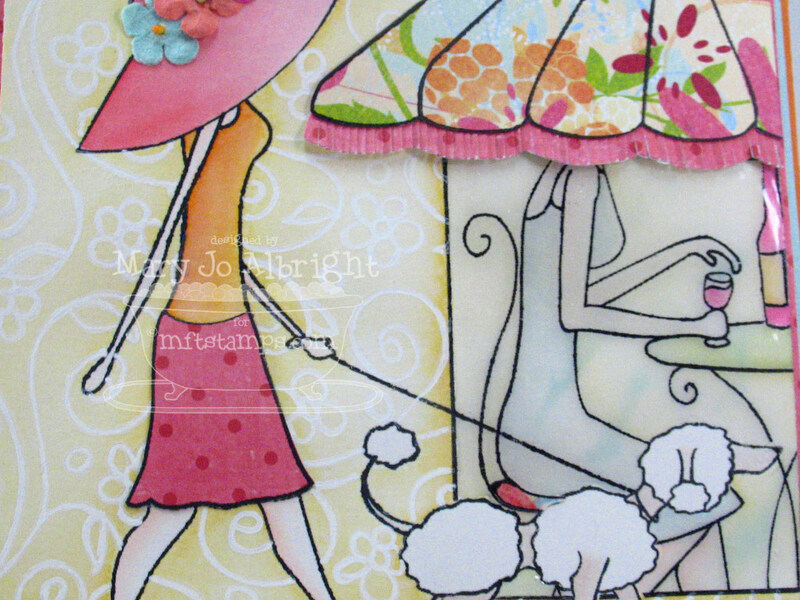 Awesome card and such a cute image. 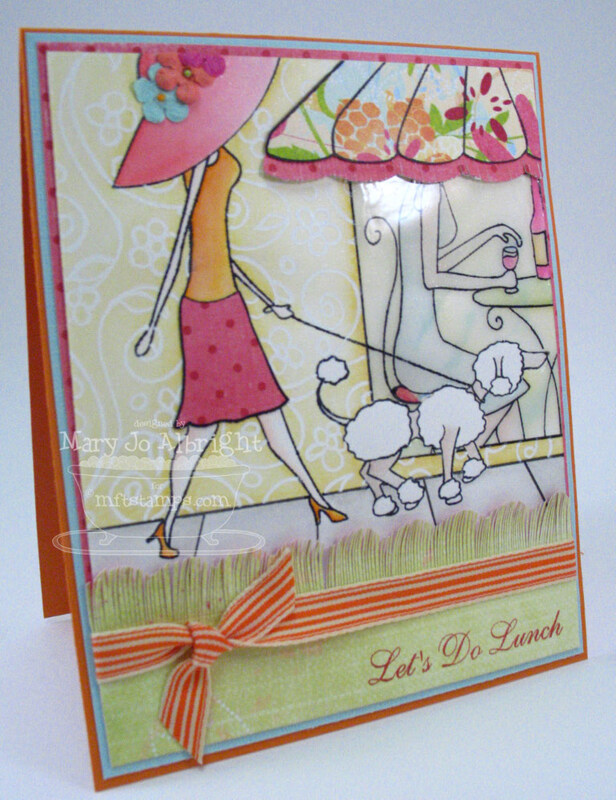 Darling cards Mary jo, LOVE the creative design and layout. Hope you have a wondful weekend! OK… it’s official… you are amazing! Both of your cards are adorable, but that masked card is jaw-dropping! You said it took you all weekend to make it, but it would take me my whole life just to “think” of such a scene! AMAZING MJ!! That MFT card is mind blowing!! It looks like a painting!! Wow girl these are rocking, awesome job. Both cards are beautiful, but your masking card is OUT OF THIS WORLD AMAZING! Your patience (and hardwork) really paid off. Thank you so much for sharing it! Wow, That is a ton of masking MJ! Very worth it though! Both cards are beauties! I love the little cupcakes sitting on the table….ok and scrolling through your blog. YESTERDAYS’ PROJECT……AMAZING! You ooze talent! Both are gorgeous, but the 2nd one — wow! Thanks for sharing that with us. It’s soooo awesome!! I am so loving all these great designs this week for Taylor’s cupcake challenge. I’m so inspired, I think I’ll play along. I also spotted your baby carriage and I LOVE IT!!!! It is so adorable. Thanks for sharing your great ideas. I don’t even know where to start!!! It is all just so FABULOUS!! I’m definitely WOWed! Holy cow! The second card is amazing. I love your masking to create that scene. I’m sure you’ve heard this more than a dozen times, but you are one AMAZING lady! Oh my goodness! Both of your cards are fabulous! You never cease to amaze me girl! 😀 Terrific job! I am glad that you were able to get your card made. It was so worth it!! Love these! Especially the 2nd one. SO much work, but so worth it!!! this is quite ingenious!! You are so creative! Rock on girl! Oh my, that masked one especially is an eye-popper AND a jaw-dropper! You need to frame that one and display it. Such beautiful work. Fun cards, like the canopy’s, how cool to combine so many sets in one and it looks terrific, love the effect of glass window! All of the extra work to mask the 4 stamp sets was worth it – it’s a beauty!!! Glad to know there is someone else out there that takes more then 30 minutes to create a masterpiece!!! You ARE a super blogger BTW. So cute! I love MFT!! Great job on the cards. Love them as I always do!! !